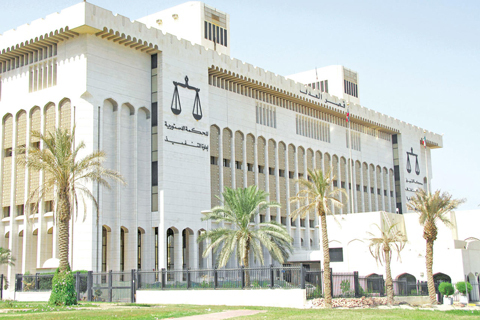 KUWAIT: In a positive gesture highly applauded by the public, the notary department’s director at the comprehensive court Hashim Al-Qallaf urged his employees to be patient and helpful while serving the public, even if any of them loses their temper. Qallaf put these instructions on signs pasted on various walls, with instructions such as: ‘Dear employees, we deal with some quick-tempered people. Be sure that this might be the result of uncontrollable circumstances only they know about. So, please help and serve them with a smile.’ Commenting on the posters, some lawyers said that they usually see posters threatening the public with prison if they threaten employees, and that such notes have angered many people. “This is the first time employees are asked to smile, even when dealing with an angry person,” they said. A group of inspectors at the Public Authority for Manpower demonstrated yesterday in protest against mandating them to use the fingerprint check in and out system. Demonstrators said that the system does not match the nature of their work and expressed willingness to use it in the morning, but stressed that it would be difficult to use it to check out, especially since they work out of their offices inspecting various companies and institutions that are most often distantly located from their offices, which makes it hard to return to office to punch out. Demonstrators slammed the decision made by the deputy director for human resources and financial affairs Kholoud Al-Shehab, as inspectors had been always exempted of the measure. They urged Minister of Social Affairs and Labor and Minister of State for Economic Affairs Hind Al-Sabeeh to immediately intervene and resolve the problem.